As Valentine's Day becomes more and more popular, certain students are vulnerable. Lack of empathy for one another is a form of bullying and can result in great unhappiness. Relational Agression or Social Alienation is a serious form of bullying, usually practiced by girls. 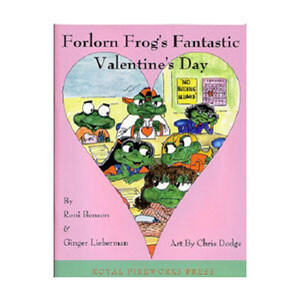 Part of our anti-bullying series (Bully Frog Teaching Stories), in this book the students at Leapfrog Elementary School come up with lots of ideas to make every student feel included on Valentine's Day. It is a lively illustrated book and the varied characters in the class learn at an early age the meaning of empathy. The students have fun with schemes and gift ideas so that no student feels left out or sad. They come to the realization that empathy means positive caring: showing kindness and consideration to one another, treating everyone equally and with respect. There is also a coloring book and a set of instructional cards, each with a lesson plan for teachers.